New England winter weather takes a toll on not just vehicles, roads and people but irrigation systems, too. 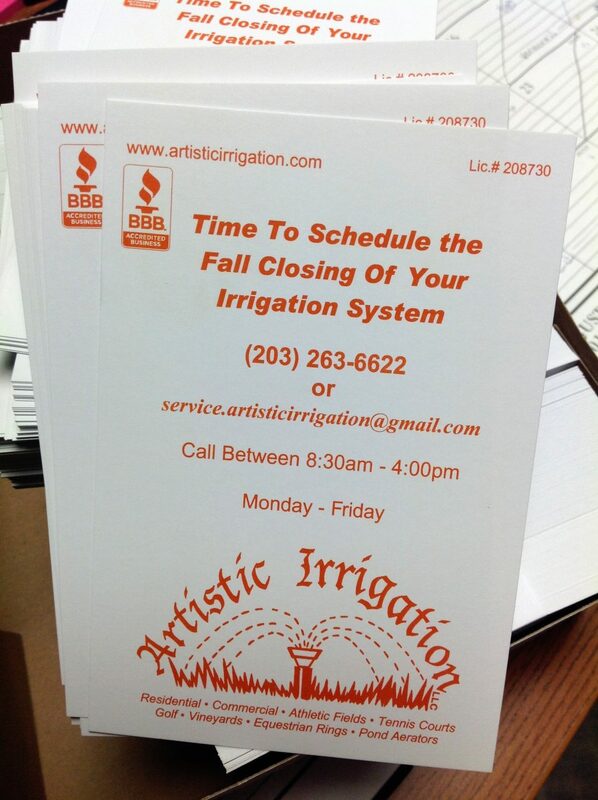 As the Labor Day weekend approaches, we have started preparing for the winterizing of the irrigation systems. During the last week of August reminder cards are mailed to clients. When we get returned calls, they are scheduled for their “blow out”. The compressors are tuned up and the trucks are ready to roll. We perform this service from a couple weeks after Labor Day to the end of October, early November. If the lines are not blown out properly, sever consequences can happen. It is important to remember it is much less costly and much less labor intensive to properly and efficiently prepare the system in the fall than to repair a damaged system in the spring.